Sega, in November 2005, decided that their newest character deserved his own game. 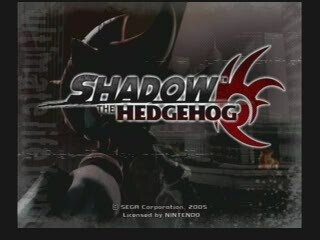 Enter Shadow the Hedgehog, a game where the protagonist this times does not fight against evil technological overlords with spin attacks or hop 'n bops or even mechs, but with machine guns. Oh, and there's aliens. The game had a remarkably chilly reception, with series fans claiming (for unfathomable reasons) that it abandoned the longstanding Sonic atmosphere. In light of the subsequent move into Arthurian werehog territory, some fans have since reconsidered that opinion. Best New Game+ time on Neutral Story: 0:18:20 by 'bertin' on 2012-04-08. I've explained that onto my stage comments. I've done better in past attempts according to the in-game timer. I soon found out later that it's faster to chaos control again immediately after the mandatory stop then run to the goal ring. Pretty solid. Actually, I have no complaints really. At first I took the top route on this stage but werster directed me towards a video that showed me that it's much slower. I did make a mistake or two here that I wince at now that I look back on it. The manual stop for Chaos Control was near perfect so I won't complain too much. This stage use to freeze on me countless times but stopped for some reason on my last few attempts. I'd say this one is probably excellent compared to my other attempts. Perfect. Took care of the Shadow Androids quickly and no hits. Just perfect. This stage can be a pain for me because of all the shield robots at the start but after that it's nothing. Pretty solid of a run as well. Hands down the reason It took me forever to sub 19. This boss is all luck since you have to hope for the best outcome. First, I try to see what his first slot will be and if its anything other than bombs or missiles I hit the last two to make boxes appear in the middle of the stage. Next, I have to hope for bombs or Shadow Fever if its the first then I shoot 18 shots at him when he tips over. If it's the latter then I hope to roll bombs and/or get a good shot at his cockpit. Looking back on this and I can tell for a fact that I can definitely sub 18:30. I was just aiming to get very good luck with this boss and eventually it happened.